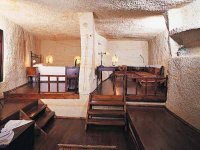 Gamirasu Hotel Cappadocia is the name of an exquisitely restored eleven-room cave house, in Ayvali Village near Ürgüp in the heart of Cappadocia, Turkey. A luxurious cave accommodation in a traditional Cappadocian village..
Goreme House Cappadocia is a traditional central Anatolian style hotel. It has been built and hand-crafted with the natual stone of Cappadocia. We offer an excellent blend of Turkish warmth and hospitality with modern, clean facilities. Karlik Evi Hotel Cappadocia Uchisar offering 20 rooms uniquely decorated with modern and clean facilities commanding spectacular views of both valley and village while capturing the magnificent colours of each sunrise and sunset. 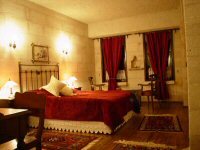 Welcome to HOTEL MUSTAFA Cappadocia Urgup , your 4 STAR accommodation in Cappadocia, Turkey. This large, modern hotel has everything you need for a memorable stay in a remarkable area. Yunak Evleri Urgup Cappadocia is a combination of six cave houses with a total of 17 private cave rooms dating back to the 5th and 6th centuries and crowned with a 19th century Greek Mansion. An old house first built 200 years ago in the historical tradition of houses carved out of rock in Cappadocia, and further extended later to become a large estate in the 1950s. Since 1985, it has been restored as a Hotel and Restaurant. The Kayadam Cave House Cappadocia is an old troglodytic house (it is what means its Turkish name), difficult to date : considering the presence of a chapel nearby, it could go up in VIth century after JC. Situated in the cliff of Ürgüp, it overlooks a vast area surrounded by mountains. Surban Hotel Cappadocia is a most charming and relaxing accomodation, the ideal operational base from which you can explore the marvels of Cappadocia. 4 DAYS CAPPADOCIA TOUR !!!!!!!!! !